"Jehangir, the son of Akbar, destroyed the Varaha Vaishnava temple in Rajasthan, even while largely continuing the more tolerant policies of his father. But his son Shah Jehan revived the crippling pilgrimage tax on Hindu pilgrims visiting Vrindavan, Mathura, Ayodhya and other holy Vaishnava centers (and destroyed more than 80 temples in Varanasi) but rescinded it later. However, Aurangzeb reinstated this tax with a vengeance and ordered large scale destruction of temples in Mathura, Vrindavan, Ayodhya (and even in southern India). The hard fact is that hardly any temples preceding the 17th century survive today in the Hindu centers in Gangetic plains. The revival of Mathura and Varanasi as religious places of Hindus perhaps owes more to the Marathas than to the Moghuls preceding them. To cite exceptional instances where Aurangzeb's Hindu nobles patronized a few Hindu temples and make much of them is like exonerating Hitler because he was a vegetarian and could not see animals suffer pain. In short, the flowering of some aspects of Vaishnavism during the rule of Mughals was not due to their patronage, but largely inspite of them and despite their periodic persecutions. The number of Hindu temples destroyed from 1500-1700 and replaced by mosques number in hundreds." "Mughal policies that encouraged trade and pilgrimage (in part because several of the Mughals collected taxes on pilgrims) benefited the sacred Vaishnava sites of Ayodhya and Vrindavan." "Doniger's suggestion that the pilgrimage taxes levied on Hindus somehow promoted the sacred sites of Ayodhya and Vrindavan ignores the simple fact that the money collected by Moghuls were not used to develop these sites. If anything, there appears to be an inverse relation between the levy of pilgrimage taxes and the growth (or decline) of Vaishnava pilgrimage centers. Akbar abolished the pilgrimage tax in 1563 and it is after this year that Vrindavan temples started getting constructed! No new temples were constructed during the reign of Shah Jehan who revived this tax. In fact, crippled by these taxes, a delegation of Hindus led by Kavindracharya Saraswati petitioned Shah Jehan successfully, who rescinded this tax under the influence of his favorite pro-Hindu Prince Dara Shikoh. The news of the abolition of this tax caused a great rejoicing amongst Hindus and a festschrift ('Kavindrachandrodaya' – the work still exists today) for Kavindracharya was compiled by all the leading teachers and Saints of the Hindus of the day. This was quite ironical if pilgrimage taxes had benefited Ayodhya and Vrindavan! But before long, Shah Jehan's son Aurangzeb revived the pilgrimage tax and also started destroying Hindu temples in his long reign from 1658-1707. Aurangzeb issued orders to destroy the temples at Ayodhya  (including the famous Treta ke Thakur and Swargadwara temples). In Mathura, the twin city of Vrindavan, he destroyed the Krishna Janmasthana temple, forcing the Hindus to stealthily remove the sacred Icons of Lord Krishna of other prominent temples in Mathura and establish them safely in the Hindu kingdom of Mewar and Jaipur. He destroyed numerous other temples in the Mathura-Vrindavan area including those constructed just a few generations earlier. Mathura was renamed as 'Islamabad'. The icons of practically all the major temples in Vrindavan established by the influence of Rupa Goswamin and his contemporaries were transferred to safe Rajput Hindu territories in Rajasthan due to actual or anticipated attacks on these temples at the orders of Aurangzeb. In short, Doniger's blanket statements are historically untenable. A more accurate way to summarize the situation would be this – "Vrindavan and Mathura lay desolate during the reign of Babar and Humayun. During the reign of Akbar, the followers of Chaitanya Mahaprabhu were inspired to rediscover and revive the sacred geography of Vrindavan. They were assisted by Man Singh, the devotedly Hindu nephew of his wife Hira Kunwar (popularly known today as Jodhabai) and a land grant from Akbar to construct the temple. 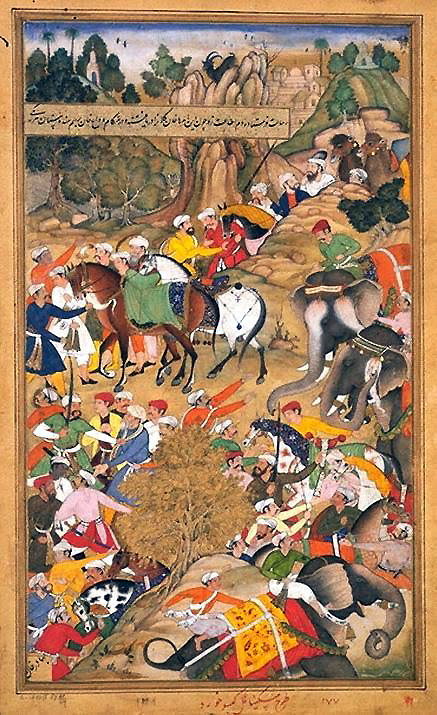 Akbar also abolished pilgrimage taxes. Patronage was continued during the reign of Jehangir but Shah Jehan reinstated the pilgrimage taxes, only to abolish them later. Numerous temples in Varanasi, Allahabad, Kashmir and Gujarat etc., were destroyed during Shah Jehan's reign. This was followed by a long 49 year reign of Aurangzeb who desecrated and destroyed numerous temples all over India, including in Vrindavan and Ayodhya. This lead to a flight of Vaishnava scholars from Vrindavan to Rajasthan, who fled with the sacred icons of the surviving temples of the region." When the 'Mugahl Influence' series resumes next week, we will begin a survey of the long list of temples destroyed by the Mughals. For all the interesting historical commentaries, pictures of royal courts, comparisons of fine art and stylistic influence, intimate pastimes of the Emperors, and analysis of the social and political impacts they had on India, a true picture of the Mughal influence on Vaisnavism and on the citizens of Mother India does not come clear until we make a detailed study of the temples that were destroyed during the nearly 200 year period of rule, from Babur's arrival in 1526 A.D., to Aurangzeb's death in 1707 A.D.